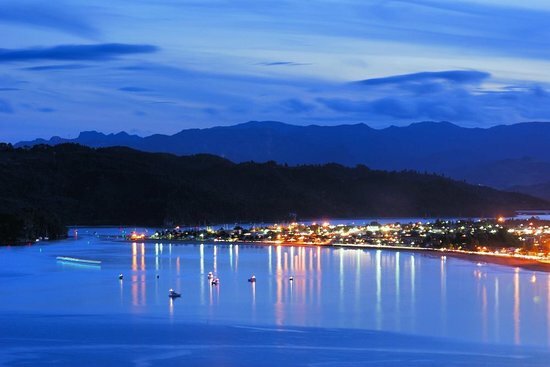 Whitianga is the largest town in Mercury Bay with a growing population of approximately 4,500 people. The local beach, the 5 km long east-facing Buffalo Beach, provides a natural foundation to the town centre which is at the southern end of the beach. Buffalo Beach is named after HMS Buffalo, which was wrecked during a storm while anchored in Mercury Bay. Her anchor is now a monument at the beach. A passenger ferry is available from Whitianga to Ferry Landing. The ferry provides very quick access to Cooks Beach, the alternative being a 45-minute drive around Whitianga Harbour. Maori explorer Kupe’s tribe settled in Whitianga in 950AD. Te Whitianga a Kupe is the original place name of the town, meaning Kupe's crossing place. Across the Whitianga River, opposite the Whitianga wharf, Whitianga Pa. The pa is protected on three sides by sheer cliffs. The hill leading up to the pa on the other side is defended by a 7 metre man-made ditch which is now part of the track leading down to Back Bay where early Maori obtained shellfish. Captain James Cook visited Whitianga and the Pa in November 1769. Whitianga rock has several holes cut into the stone that were used as firepits, water stores, and palisade holes. Cook noted burnt palisade stumps as evidence that an earlier attack had evicted the pa's residents. Mercury Bay was originally called Te Whanganui A Hei, (the Great Bay of Hei) named by local iwi, Ngati Hei in honour of their leader. James Cook renamed it “Mercury Bay” in celebration of his observation of the transit of Mercury carried out by his scientific officer, Charles Green. Green was the Royal Society’s expedition astronomer who unfortunately died on the homeward journey in 1771. The sighting of the Transit of Mercury is commemorated at Cooks Beach by a cairn of Coromandel granite which tells the story; "In this bay was anchored 5 Nov 1769, HMS Endeavour, Lieutenant James Cook RN, Commander. He observed the transit of Mercury and named this bay." Europeans began settling the Whitianga area between 1836 and 1881. They were drawn to the area by gold, gum, flax and kauri. Timber milling, boat building, flax milling, gold mining and gum digging provided employment by early settlers. For many years, Whitianga was a leading timber port, with sailing ships from Norway, Sweden, France, Italy and Great Britain coming to load timber. It is estimated that more than 150 million metres of kauri was exported from the Whitianga district. Kauri gum was first exported in 1844 and within 50 years more than 11,000 long tons of gum was exported annually. 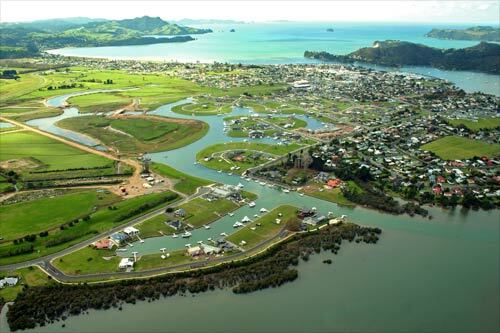 Whitianga in recent years has seen some commercial and residential building development, including properties overlooking the harbour and a canal development providing a waterways environment. Mercury Bay Area School is a coeducational composite school with roll of more than 800 pupils. The first primary school opened in the area in 1872. A district high school opened in 1951 and moved to the present site of the school two years later. In February 1981 it became an area school (a public school catering for students from Year 1 to Year13). It is now New Zealand's largest area school. The school is renowned for its innovative programmes, including a marine academy and an aviation engineering programme.